I have found a product that I really like and it’s called Pro-sculpt. Pro-sculpt is classified as a ‘fat burner’ and it is from GNC. You can watch my video review of my fat burner stack or I will give you the key points here in this post. Pro-sculpt is great because it contains 3 of the supplements I took in my last show prep. vitamins and a scoop of Pro-sculpt. make me feel good and have great focus. It has green tea and white willow bark which are fat burners. It also contains BCAA: In our studio we take Branch Chain Amino Acids (BCAA) during our workout. BCAAs help with muscle recovery and it helps you to not be so sore. Pro-sculpt has the amino L-Glutamine which is very important for muscle recovery. It also is an immune system boost. Pro-sculpt also contains CLA: Conjugated Linoleic Acid is an essential fatty acid that not only reduces body fat from the mid- section region, but also increases muscle strength and exercise endurance. The recommendation for CLA is that you drink 100 oz of water each day to flush out the toxins. Just a heads up! CLA makes you pee a lot! Did I just say that? I’ll bet I get an AMEN here. Pro-sculpt also contains Beta Alanine which is an amino acid that gets your muscles prepared to train. It also has L-Carnatine for even more energy and fat burning. Whoo-hoo. This product is a supplement /fat burner stack. It is not classified as my pre-workout. I use Cellucore’s C4 exactly 30 minutes prior to lifting for amazing results. I will do another blog post on pre-workout. 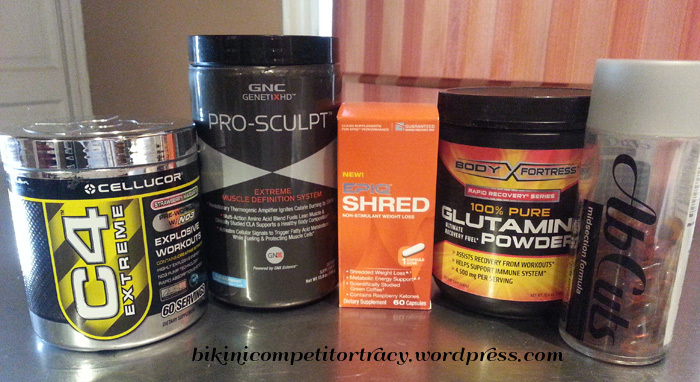 Because you must cycle off Pro-sculpt after 60 days, I had to use these products as a replacement for 30 days. We cycle our supplements because, like exercise, your body somewhat adapts and it stops being as effective. I typically do not mind switching up because this is when I find products that really work for me. Fat burner: GNC Epiq Shred capsules: 1 per day. I used this fat burner for two cycles during my first show prep. I had amazing results. I love it. It does not make me feel jiggy at all. Since I cannot take Roxy like many of the other competitors do, I felt really happy that I got such a good result with a non-stimulant product. Ab-cuts: AbCuts is CLA. The AbCut company has several different versions of this product but I bought the basic mid-section formula at Wal-Mart for 17.99. The down side is that you must take 2-3 capsules with each meal. That made it tedious. If you shop online or at GNC for Abcuts, be prepared to pay over 50 dollars for it. It works. You can also buy straight CLA from GNC. CLA is typically not sold at Walgreens or drugstores. Glutamine: I purchased a container of Glutamine from Amazon. It was a very basic, generic brand. You don’t need fancy here. I take other variations of BA and Carnatine as well but frankly, it sure is nice having everything in one product. This product got 4 out of 5 stars on the GNC website. It retails for 49.99 for non-members and 34.99 for members. I try to get my products on a BOGO so I have two months worth ready to go. It comes in Blue Raspberry and Fruit Punch. Both flavors are fine. Worth noting: Glutamine is in many products that are marketed for muscle recovery. It is a bit powdery and hard to mix. The same goes for Pro-sculpt. I use my Ninja Blender but if you have some good arm strength you can get it done with your blender bottle. My recommendation is Pro-sculpt over the other 3 product stack. I am not loving my results as much with this interim replacement stack. It just doesn’t wow me. I’m preparing to begin another two month round of PS as I begin my show prep. I will have to pull all my supplements close to the show so this will be perfect. Not every supplement is right for everyone. One of the reps at GNC told me he thought this product was not good. I say different strokes for different folks. This one in my book is a winner.